Eliminate mixing mistakes and inconsistencies. 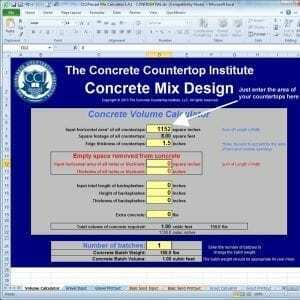 This easy-to-use precast mix calculator, in the form of an Excel spreadsheet, calculates exactly how much of each ingredient, including pigments and decorative glass, and produces a printable batch report for you to use while mixing. It even comes with sample colors to get you started. It also includes a grout calculator and a calculator for how much ice to use if you need to cool your concrete in hot weather.